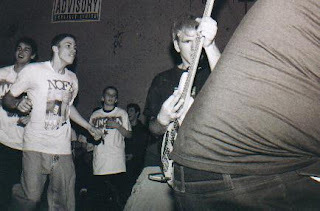 Active 1998-2001, from Cincinnati I believe. They play a fairly weird brand of stuff. Sounds very 90's influenced, but definitely has hints of crazier bands from the 2000's. Members went on to Noarmsnolegs, and They Found My Naked Corpse Face Down In The Snow. The band actually sounds quite a bit like a 90's version of Naked Corpse. Last.fm has a pretty good description on them if you'd like to know more. Here is all they've released. I definitely recommend A Uniform Infinity above the others, as the early stuff is quite different from the later. Good stuff overall.